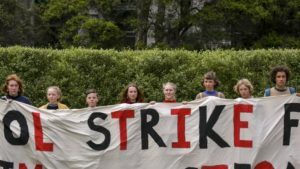 The Strike4Climate across Australia is the beginning of a student uprising to protect our future. These kinds of social movement uprisings don’t happen very often. The last one here was in 2003 in the lead up to the War in Iraq. Back then we organised the largest rally in Australia’s history – 500 000 people. It felt amazing. But it wasn’t enough – the war happened and the social movement wasn’t strong enough to maintain the pressure for the long haul. I learnt a lot about explosive social uprisings from that time. Now, as a parent deeply supportive of everything you and other students are doing – I thought I’d share a few lessons that I learnt – with the hope that you will be stronger than we were in 2003. Coincidentally, the first rally in Sydney to build the Walk against the War movement was on Saturday 30 November 2002. It was several thousand people big. Then on 15 February there was a rally of over literally millions of people in different locations across Australia as the deadline to war loomed. I’ll never forget that rally, like you will never forget this strike. But remember rallies are not the only means to build people power. In 2003 if we only had a wider variety of demands and targets (see below) and a bigger, deeper broader movement (see below) we would have been powerful for longer. Over the last 50 years, progressive students have used “summer” as a time for quietly getting stronger in order to launch more powerfully in the new year. Freedom summers in the 1960s in the US and Australia saw university students attempt to desegregate regional communities. In the 2000s, a program called union summer saw young people learn about the union movement. In 2003, we used that time to be build our network ready for the February 2003 rallies. What if there was a “Climate Summer”? There could be organising training so you could learn more about how to build powerful school based teams and learn about how to run campaigns. In community organising we always talk about the need to cut a “problem” into an “issue.” That means, we need to turn something big into something tangible that we can act on. This is critical for the student climate movement. We can symbolically strike for climate – but the movement will only last and grow if people have a sense that they can take meaningful action that will achieve something specific. There are many ways this can play out, I can think of two very tangible idea. 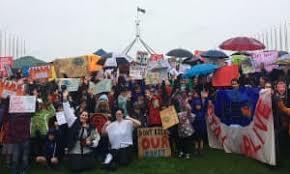 One is to connect with the biggest, sharpest part of the climate movement – the Stop Adani campaign. The proposed Adani Mine would be the largest mine in the world. But if we are to have a hope of stopping climate change globally – it needs to stay in the ground. Your school group could join that movement and take action locally – you could join up with us oldies or stay more autonomous – more info here. Two is to make your school a climate friendly zone. You could audit your school – for energy use, water use, waste and work out how to make it carbon neutral. The point of doing this is to involve as many students, teachers, parents, school staff as possible. You won’t solve climate change at your school – but you might help teach hundreds of young people how they can meaningfully make change. And that will be essential for building a strong movement long term. My guess is that a good bunch of students are planning on coming to the strike – but not the whole school. That means right in your own school you have an opportunity to build a bigger movement. You know how to do this – talk to people! Ideally 1-1 chats. Make a plan, identify people who might be more interested and have those conversations. Those conversations are not about you telling (selling) why this issue is important. It’s all about asking what matters to them and exploring if how it might connect to the future of our climate. You will need a group – possibly several groups at school. Recruit people to the group. Make a plan to do work on an issue. Take some action and get more people to join the group. You might need teams if you are really successful! One of the magical tools that all young people have is that there are a ready set of adults you have genuine influence over – your parents. Part of the school outreach plan could be to take school organising home. If your parents are onside, then maybe get them to help with the organising! If you need help with how to have these conversations – don’t worry. Perhaps it’s something to include in the Climate Summer training, and/or the Australian Youth Climate Coalition has offered training in this space in the past. Other schools need to be in this too. There are 2500 public schools in NSW and at least another 500 private and Catholic schools. So why not pick one and see if they want to be your buddy. How? Identify one and call them up – ask the front office if you can leave a message for the student leaders or SRC. See if they are already organised or if they are interested in getting some help. The school could be local or somewhere across town, or across the country. Your call. Closer is easier but distance means you might learn something more while you organise for your future. At some point the #Strike4Climate may build digital tools to make these connections easier – but don’t let time stop you. Get on the phone!! There are plenty of adults organising – you could connect with them. Anything from Stop Adani groups to GetUp groups to Sustainability groups and more. 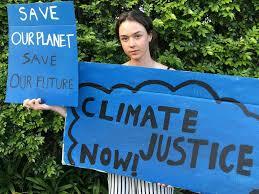 There are also plenty of young adults at university and through the Australian Youth Climate Coalition. Beyond this – there are ways to map your community and reach out to local organisations. If you are interested in this kind of work – Climate Summer training might be perfect for you. We need to engage our decision makers – the people adults elect to take responsibility for our wellbeing. This engagement always starts formally – letters and meetings – that make clear specific asks for them to respond to (see “demands”). But if politicians are not prepared to protect our future then stronger action is needed. Action always has two purposes – push a decision maker – like a politician, and build broader support. These dual goals are especially important in the lead up to an election, because if the politician isn’t listening – they might lose their seat. Get creative about what you can do – demonstrations are fine – but how could they be more interesting? Can people dress up? Dance? What could make your protest stand out and get noticed? Elections are a good time to talk to as many voters as possible. GetUp uses a phone banking tool that allows you to make lots of phone calls (they did this for the marriage equality campaign), Stop Adani will do something similar for door knocking. Or make your own plan – door knock your own streets (be safe, always go in pairs and teams – and if you’re uncertain take an adult along). Sometimes, even if you are incredibly creative – your action doesn’t get a reaction. What do you do? Some consider non-violent civil disobedience and more confrontational tactics. Again – that’s the kind of thing that works better with a little training. So I hope these lessons are of use. I hope they help you imagine your next steps. Adults have struggled to turn this debate in Australia for the last decade. I hope that you – connected, skilled and strong – might help create the social movement that wakes the country up and turns the corner on climate change. You can view this as a google doc here.